March 9th, 2015 - Toyota Forklifts of Atlanta Delivers Toyota's 500,000 Forklift to Rock Tenn! TMHNA CEO Brett Wood, TMHU President Jeff Rufener, and TIEM President Alex Zensho, visited Toyota Forklifts of Atlanta in Atlanta, Georgia, last month. 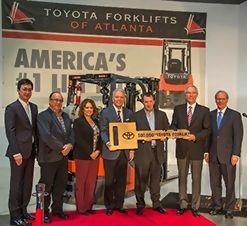 Wood, Rufener and Zensho presented Toyota Forklifts of Atlanta customer, RockTenn, with the 500,000th forklift manufactured in North America. Toyota has been producing forklifts in the United States for 15 years. The Columbus, Indiana facility employs over 800 associates and is ISO 14001, making it one of the most environmentally friendly production facilities in America. This plant received "Top Plant" from Plant Engineering in 2010 and was listed as one of the best plants in America by Industry Week Magazine in 2011. Most of the parts used to produce forklifts from this plant are also produced in the U.S.A., which provides thousands of additional jobs in the region. All of us at Toyota Forklifts of Atlanta are proud to be associated with a company with a mission that includes creating the highest quality products, locally, with minimum environmental impact. And we are even more proud to deliver the 500,000 forklift produced from this plant to one of our greatest customers, RockTenn. RockTenn, a leading North American integrated producer of consumer packaging and recycling solutions has been a Toyota Forklifts of Atlanta customer for more than 10 years and has a large fleet of Toyota forklifts.